Airbus A350 world tour landed in Sydney this morning at 06:36. The fifth test aircraft MSN5 which is undertaking the three week long route proving campaign touched down after flying direct from Johannesburg in a little over 12 hours. MSN5 was unrestricted by ETOPS operations as they were test flights carrying only crew and Airbus technical staff. After approximately seven hours on the ground where it was shown off to Qantas, Virgin Australia and local media it rotated off Sydney’s runway 16R for Auckland at 14:21. It will continue to Chile on Wednesday evening. While on the ground A350 project test pilot Frank Chapman confirmed a long unconfirmed rumour that Airbus was indeed pursuing 420 minute ETOPS approval for all members of the A350 family. 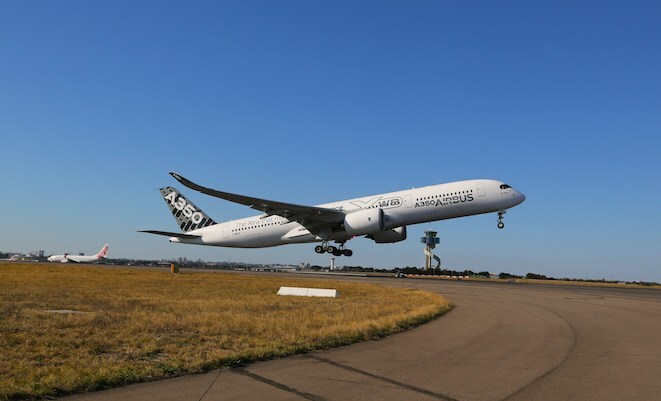 420 minute approval – 7 hours flying time from a suitable diversion – would deliver the A350 the ability to operate virtually anywhere in the world unrestricted, except over the south pole. Feature image by Jaryd Stock, other images by Carry-on. Original post updated 10 August, 22:00.